It seems that Obama will win both the popular and the electoral votes, after all! Congratulations on another 4 years! Good luck! I hope President Obama can change his next four years to make the public more confident in his ability to lead and make change for America. I am sorry to see Gov. Romney lose but I hope President Obama can learn from this tight race. “I woke up at 6:15 a.m, just minutes before CNN called the election for President Barack Obama, in my hotel room overlooking Tahrir Square to find nothing out of the ordinary. Early morning Cairo was hazy, slowly waking up, just a few cars in the street. Cairenes like to say their's is a city that never sleeps, but 6:15 a.m. is where you discover, well, even this sleepless city needs a few hours of rest. After hearing Wolf Blitzer give the details, a banner appeared at the bottom of my screen, which was tuned into Egyptian Channel 1. It wasn't until 7 a.m. that an anchor and a reporter (on the phone from Washington, D.C.) discussed the news. In the news studio, another journalist noted, as is well known here, that most Egyptians preferred President Barack Obama over Mitt Romney because, in his words, "the Republican Party is hardline on the Palestinians." As an American living/working in Vietnam, I couldn't be more proud to say that I live in a country with Obama as my leader! As a true global citizen and humanitarian, I know the importance and value of having a president that understands the world and it's problems. I know the importance and value of a having a president who realizes that what America does and how they react greatly effect our entire world and everybody in it. He IS in fact the President of The United States, so I would imagine that he would be more focused on the U.S. than a country in the Middle East. Yes that is important, but right now we need to focus on us. guess I am staying overseas for another 4 years...but glad the mudslinging and negativity is over.. I warm Congratulations to President Obama!! This is a great day in U.S. history and Taiwan looks forward to a greater America in the next four years and even better U.S.-Taiwan relations!! I just relocated from NY to Dubai - company transfer. The overall sentiment over here is of satisfaction that Obama is keeping the White House. “On behalf of the Government and people of Australia, I offer warm congratulations to President Barack Obama on his re-election and wish him every success for his second term in office. 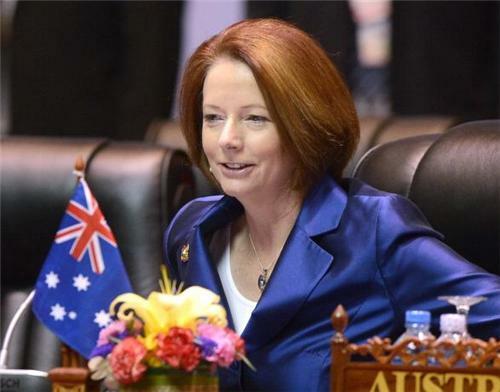 Australia has worked closely with President Obama and his Administration over the past four years. I look forward to continuing this friendship. Australia and the United States are unique partners, linked through culture, values, shared sacrifice and a commitment to international peace and security. " First I wish to thank CNN for Excellent coverage of the Election results. Secondly, even though I am a Kenyan living in Kenya I wish to say that I am very proud of the American People for demonstrating to the rest of the world that America is a land of equal opportunities, and even Obama, a son of a humble African Man from Kenya can become the President of the most Powerful Nation on Earth. That to me is very humbling. That is the reason why America is perceived as the world leader. My only request to Obama and the American people is this: Mankind must win the war on Climate change and Global warming. 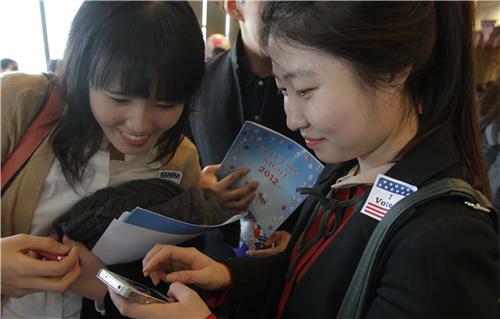 Wang2Yuan writes on a Chinese micro-blogging site: "This is my first time experiencing the election in the U.S. I was drinking coke and watching the live shots, watching other people’s democracy, it's like watching spring night. But democracy is far from me, no matter if it is U.S’s, or my homeland’s [China]." 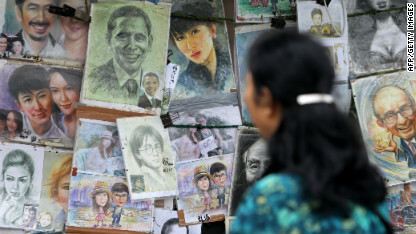 Global reach: News of Obama's win ripples across Asia. Congratulations @BarackObama on being elected to a 2nd term. I hope our countries’ relationship continues to go from strength to strength. Nothing says it better than a photo. Here’s our pick – so far – of the best images of world reaction to Obama’s win. This one shows students at the State Elementary School Menteng 01, where U.S. President Barack Obama studied from 1970-1971, cheering as they watch the U.S presidential election on television in Jakarta, Indonesia. Journos got off easy. Early night. President Gül and PM Erdogan conveyed their congratulations to President Obama on his electoral success and re-election as US President. No doubt we’ll be seeing quite a few clips from this… Obama’s full acceptance speech. Read the story on CNN.com. Interesting stat… Obama’s three-word tweet -- Four more years -- featuring a photo of the U.S. president embracing his wife, has been re-tweeted more than half a million times. The financial world is now waiting to see what the United States does to tackle the so-called fiscal cliff, which experts say could send the economy into a recession if it isn’t addressed by December 31. "It's a sort of game of Congressional chicken taking place, just as we saw in the summer of 2011," said Sir Martin Sorrell, CEO of WPP Group. Election Night was filled with genuine emotions on Twitter, following months of sharp exchanges, memes and too many jokes to count. “Spaniards closely followed the U.S. presidential race, especially because Spain was mentioned during the campaign as a big problem among European nations suffering an economic crisis. The jobless rate here is more than 25%. CNN’s Kristie Lu Stout explains why China is breathing a sigh of relief after Obama’s victory. "China is quite happy that Obama won the election because Obama is a known entity," said political columnist Frank Ching. "It's better to have the devil you know, than the one you don't." But the state-run People's Daily portends dark days ahead for the U.S. president: "As soon as Obama gets re-elected, he will immediately be confronted with the strangling of Washington's political machine." I'm a belgian citizen, it is a great day for your country and for your President, that I always supported over here in my country. A great day for me also, it is my birthday: 64y. 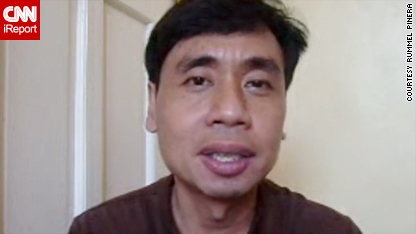 For iReporter Rummel Pinera, who has been keeping tabs on the presidential race from his home in the Philippines, Obama's victory was a vindication of his hopes. Pinera said Obama's victory will work well for Filipinos, many of whom work overseas and send invaluable remittances, or funds, back home to support their families. "The Obama administration's job-creating programs will certainly benefit Filipino migrant workers who are employed in the U.S., as well as such workers' families here in the Philippines," he said. What do you think about the U.S. election? How does it affect you? Send us an iReport! 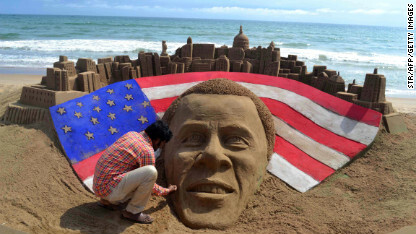 Indian artist Sudaran Pattnaik adds final touches to his Obama sand sculpture at Golden Sea Beach in Puri, India. That's it from Nick, Hilary, Kyle and myself. The blog is now closed. Thank you to all those who joined us over the last 48 hours. We had so many insightful comments and observations we became chained to our desks to make sure we included as many as possible. It's was an exciting moment in history and we're happy we got to share it with you. Guess we'll see you back here in four years. Until then, Goodbye! How did the world respond to President Obama’s re-election? Relive the night (and early morning) all right here, with comments, photos, videos and analysis from CNN correspondents around the globe. The blog is now closed, but you can still get full election results here. And CNN.com, of course, will be following up with many more stories as we step back and digest this moment in history.